Responding to high-profile shootings since the late 1980s, school districts stationed police officers on campuses. After the murder of 20 children in Newtown, Conn., parents may find some reassurance in a single fact: Students are far less likely to be killed in school than elsewhere. In the 2009-2010 year, 17 children age 5 to 18 died in homicides at school, traveling to or from campuses or at school events, according to the US Education Department. That’s about half the annual figure during much of the 1990s. In a population of more than 50 million students, the school-related death toll has been about 1 percent of all homicides for that age group. Responding to high-profile shootings since the late 1980s, school districts stationed police officers on campuses, established single points of entry for buildings, trained staff through ‘‘lockdown drills’’ to minimize casualties, and promoted programs to teach conflict resolution and fight bullying. On Monday, some parents kept their children home from school, some school districts added extra security, and police investigated several reported threats against schools. 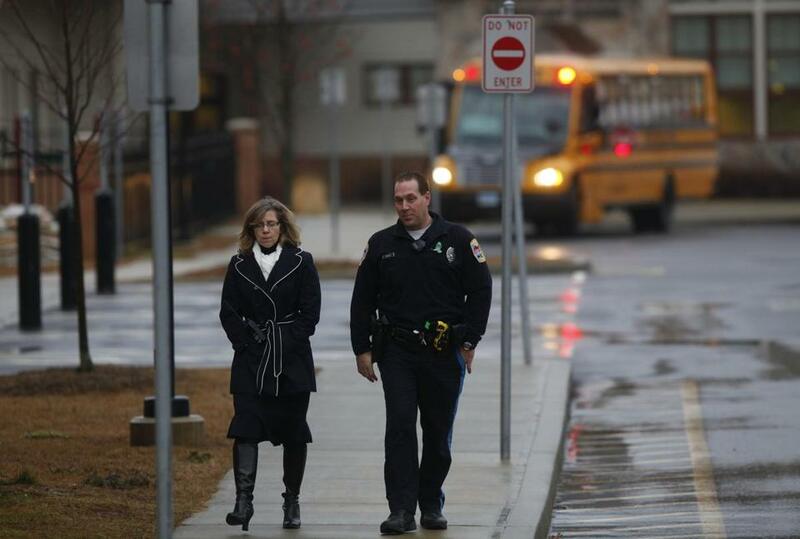 But for the most part, the first day of classes since the Newtown massacre was routine. Police in California said Monday that a man was arrested and nine guns, including rifles, were seized after Los Angeles elementary schools reportedly were threatened in a social media post. The Associated Press later reported that Kyle Bangayan, 24, of Pomona would not face charges because there was no specific threat. In northern Oklahoma town of Bartlesville, police said Monday that a small-caliber rifle and notes about a possible attack on a high school were found at the home of a teenager accused of plotting to shoot classmates and detonate bombs. Sammie Eaglebear Chavez, 18, has been charged with a felony count of planning violence. Nationwide, the safety measures public schools have put in place in recent years followed two previous school attacks: At Columbine High School in Littleton, Colo., two students in 1999 killed 12 classmates and a teacher. At Cleveland Elementary School in Stockton, Calif., a gunman in 1989 murdered five students. Security often varies based on the age of schools, as newer buildings typically have the most important protection — a single entryway, often with a vestibule or buzzer to control access — according to Paul Timm, president of RETA Security Inc., which consults with school districts. Middle schools and high schools often station a police officer on their campus, both for security and to train staff and form relationships with students to prevent violence, said Mo Canady, executive director of the National Association of School Resource Officers in Hoover, Ala. Such full-time officers are less common in elementary schools. Though some schools have tried metal detectors, most have found the technology expensive, unnecessary, and difficult to staff, security specialists said. Hamilton High School in Chandler, Ariz., has eight security guards on its fenced-in campus of 3,600 students, along with a system of guest passes. The school doesn’t subject everyone to searches with metal detectors, as they do at airports, an approach that would be unworkable, said Richard Baniszewski, Hamilton’s assistant principal. After Columbine, school districts have increasingly focused on what Brock calls ‘‘psychological security,’’ or measures that foster communication among staff, parents, and students. The shooting at Sandy Hook Elementary School in Connecticut illustrates the limits of these measures. The school locked its entrances and controlled entry through a buzzer system and its staff seemed to follow a lockdown plan. But the heavily armed gunman, Adam Lanza, forced his way in, authorities said.